Wind turbine farms cause deaths to tens of thousands of birds, including eagles. Why do bald eagles still need our help? Throughout history bald eagles have been shot and killed by farmers, hunters, and profit-seekers. Though shooting continues to be a major problem for the Bald Eagle, recently a more subtle threat has surfaced. Lead poisoning has become one of the primary causes of death for Bald Eagles. This poisoning occurs when the Bald Eagle feeds off carrion (dead animals) that have been shot with lead bullets. Millions of birds are affected annually. Through the process known as biomagnification or amplification, the lead ingested by the Bald Eagle from feeding on carrion remains in the eagle’s body and eventually accumulates to highly toxic levels. This process of accumulating large quantities of poison in the body is the same process that occurs with the chemical pesticide DDT which nearly caused the extinction of the Bald Eagle in the early 1960s. As with DDT, the Bald Eagle may not die immediately, but eventually suffers from the lethal effects of the lead poisoning. Lead has no known biologically beneficial role. In 1977, the U.S. Consumer Product Safety Commission banned lead paint in residential and public buildings as well as in toys and furniture, and in 1996 it was banned from use in gasoline. In 1991, it was banned for waterfowl hunting, however, lead is still a leading metal used in the ammunition for upland hunting, shooting sports and in fishing tackle. This presents a significant threat to Bald Eagles as this species’ diet primarily consists of fish, waterfowl, and carrion. Eagles frequently scavenge carcasses of deer, pheasants and other wildlife that may harbor lead or lead fragments. Waterfowl and fish impaired by lead ingestion become easy targets for Eagles. When ingested in large enough quantities, lead has detrimental effects on the nervous and reproductive systems of mammals and birds. Eagles with lead poisoning may exhibit loss of balance, gasping, tremors and impaired ability to fly. Emaciation follows and death can occur within 2 to 3 weeks after lead ingestion. Concerns over the known and potential impacts of lead on wildlife. Iowa Department of Natural Resources. A PDF document. Press release about the harmful effects of lead. Article about toxins such as lead. Wind Turbine companies have been given a 30-year exemption from the Federal Goverment to kill Eagles. Save the Eagles International reports that wind farms are actually slaughtering millions of birds and bats annually. American Eagle Foundation president and founder, Al Cecere, appeared on Fox News to discuss the ramifications of this extension, stating: “I think this is appalling and outrageous. I don’t think this is good conservation policy. I think this is a lot of politics, and, believe me, I educate people on both sides of the aisle. I’ve been saving eagles for nearly 30 years. It took over 30 years to bring the Bald Eagle back from the brink of extinction. A lot of work by hundreds of conservation groups and thousands of individuals across the country have put their heart and soul into this effort. Green energy is commendable. Everyone supports it; but modifications must be made in wind turbines—and where they are placed—to counteract the needless slaughter of these magnificent animals. In February 2016, Auburn University conducted a study at NREL’s National Wind Technology Center near Boulder, CO. The goal was to do everthing they could to understand how birds interact with the windfarms. Watch a video. A Mathematical Model to Predict How Many Eagles Wind Farms Will Kill. Electrocution is among the top five causes of Bald Eagle deaths. A Bald Eagle perched upon a high-voltage power pole may inadvertently touch the power source and the ground at the same time. When this happens, the bird is killed instantly. Bald Eagles may also fly directly into power lines that are not visible in poor weather conditions. Naturalists propose three suggestions for improving the safety of current power lines for Bald Eagles: removing the top crossbar to make them less attractive perch sites, installing a barrier to prevent the eagle from touching the ground and power source at the same time, and building artificial perches above the crossbar where electrocutions usually occur. Raptors are opportunistic and may use power poles for a number of purposes. In open habitats where few natural perches exist, such as deserts, grasslands, agricultural fields, and pastures, raptors are attracted to power poles, which provide roosting and nesting sites as well as hunting perches. However, utility structures can also pose a threat to raptors and other birds through electrocutions or collisions. Records of electrocutions and collisions date back to the late 19th century; however, avian deaths associated with power lines were not a widespread concern until the 1970’s when surveys in the western United States found hundreds of eagles shot, poisoned, and electrocuted in rural areas. Solutions to this problem are well documented and have been implemented by conscientious power companies. The use of synthetic chemicals to control insects and weeds became very popular after WWII. The chemicals increased crop production and eliminated insect pests—but at a cost no one could have imagined! Pollution caused by humans has caused devastating consequences to wildlife habitat. The Bald Eagle, Peregrine Falcon, and Brown Pelican nearly became extinct because of the widespread use of DDT. DDT is an insecticide that has been widely used for pest control. The three letters come from the chemical name, dichloro-diphenyl-trichloroethane. This grayish-white powder kills insects by affecting the nervous system. DDT decays slowly and appears in the birds, fish, and animals that eat plants. Some DDT never reaches the pest or insect that it is supposed to control. Small particles of DDT travel through the air and water. It is then absorbed in the organs and tissues of birds and animals. DDT is also taken indirectly when birds and fish eat organisms that contain the pesticide. DDT then passes from one organism to another through the food chain. A large fish can take in heavy amounts of DDT by eating smaller fish that have the material in their body. If a bird then eats the fish, the concentrated DDT is passed into the bird’s body. This is an illustration of a food chain. DDT has been used on a large scale. DDT has killed useful insects, as well as harmful ones. It may have also endangered other animal life, including birds and fish. Ingestion of pesticides such as DDT has disrupted the reproductive systems of female eagles, often causing their eggs to be infertile. The amount of calcium in the eggshells also becomes reduced, causing them to become thin and brittle and , consequently, to break during incubation. DDT was banned in the United States in 1973. However, since it is used in Mexico, the effects of DDT are still being felt in the United States. Wind carries DDT across the man-made borders. To learn more about DDT and other chemical pesticides, read the landmark book by Rachel Carson (1962) entitled Silent Spring. Oil spills, like the one caused by the grounding of the Exxon Valdez in Alaska, pollutes the environment, causing the deaths of countless wildlife. Since people have become increasingly aware of the adverse effects of indiscriminate use of pesticides, alternatives ways of controlling unwanted pests are increasingly being used by farmers. The interest in pesticide-free farming and gardening is increasing as the side effects of chemicals become apparent. A comprehensive article about these issues can be found in MarineBio. As shocking as it may seem, poaching may still pose a danger for the Bald Eagle. 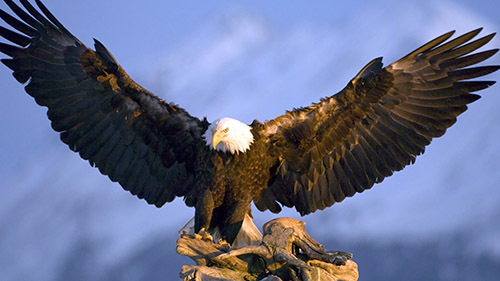 News articles abound with reports of Bald Eagles being deliberately killed by poachers. Throughout its history the Bald Eagle has suffered persecution by farmers and landowners who suspect the Bald Eagle of preying on their livestock. At one time, people were rewarded with bounties for killing eagles and turning in their talons or body parts. This fear on the part of ranchers and livestock owners lives on and many eagle deaths still result from the actions of such irresponsible, uneducated people. Some Bald Eagles are deliberately killed for their distinctive feathers. People pay large sums of money to purchase authenic Indian crafts and artifacts which require eagle feathers. These crafts are sold in the Americas and Europe for high prices. For example, an Indian war bonnet may fetch over $5,000 on the black market. Often the juvenile bald eagle with its brown head is mistaken for a hawk and killed. Much more often, eagle shootings are deliberate. In addition to shootings, Bald Eagles are often found caught in leg traps meant to capture other predators such as coyotes. Bald eagles will opportunistically feed off the trap bait or even off an animal already caught in the trap. The eagle becomes ensnared in a trap when seizing bait or approaching a nearby trap. Some eagles lose a leg or are otherwise crippled so that they become unable to fend for themselves in the wild. At the top of its food chain, the adult bald eagle has no natural predators. Unfortunately this does not mean that the Bald Eagle as a species faces no dangers. In fact, the mortality rate of eagle eggs, hatchlings, and first year juveniles is extremely high. A wide variety of factors can contribute to the infertility of an eagle egg. A crow or raccoon may peck at the shell and crack it, leaving it open to bacteria or dried membranes. The parent eagles may be distracted and leave the egg unprotected from cold or heat. Since the egg needs a steady temperature of 99.5 degrees Fahrenheit to survive, an absence of less than a minute may cause death. Ingested poisons from leadshot or other contaminants may render the egg infertile. The juvenile eagle faces as many threats. In fact, the first year of life of the Bald Eagle is its most dangerous. The young eagle must learn to fly, hunt, and fend for itself in the wild. Without parental assistance, young eagles often fall prey to the same fate as older eagles: poisoning, shooting, electrocution, and even starvation. In addition, man, knowingly or not, has become the Bald Eagle’s greatest threat. Through the destruction of the bald eagle’s natural habitat and the introduction of new chemicals into the environment, man unwittingly has severely harmed the bald eagle’s chances of survival. Other irresponsible people deliberately kill or maim bald eagles. By learning about what the Bald Eagle needs to survive and working together to prevent unnatural deaths, man can become the Bald Eagle’s greatest support rather than its most threatening enemy. Today, even as the Bald Eagle population slowly recovers as people work together to restore the country’s national symbol to its former status, new man-made threats continue to arise. The factor which most significantly affects the future of the Bald Eagle population is the destruction of its natural habitat. As the human population grows, the Bald Eagle population declines. The most destructive human activity is the development of waterfront property. Because eagles depend on shoreline habitats and aquatic food sources, human development in these coveted areas poses the greatest threat to the Bald Eagle’s survival. In addition, the cutting of “old growth forests” where Bald Eagles prefer to nest and perch has conflicted with the interests of people seeking lumber for housing and commercial products. The sensitive issue of accommodating human needs and desires, while at the same time preserving our wildlife resources, can destroy communities. However, working together to come to reasonable agreements regarding the protection of wildlife can also have the opposite effect. At one time, only the Bald Eagle itself was protected by law. Today, the eagle’s “critical habitat” is also protected, but only on public lands. Habitat management plans today call for groups of concerned citizens, agencies, and organizations to work together to reach common agreements regarding changes in the environment. Most habitat management plans concerning the Bald Eagle involve protecting nesting trees. Agreements which allow buffer zones around these sites have permitted human activity while preserving Bald Eagle nests. The most important weapon in the fight to save the Bald Eagle will be the education of and communication with people. For a large bird with no natural predators, the mortality or death rate of the Bald Eagle is quite high. The chances of a juvenile bald eagle surviving its first year of life today are less than 50%. After that first year, the Bald Eagle stands a much better chance of living to its full lifespan, which is anywhere from 30-40 years in the wild. The mortality rate of the Bald Eagle falls to about 25% after the first year of life. The hazards of the wild are clear when one considers that a Bald Eagle raised in captivity may add an additional ten years to its lifetime.